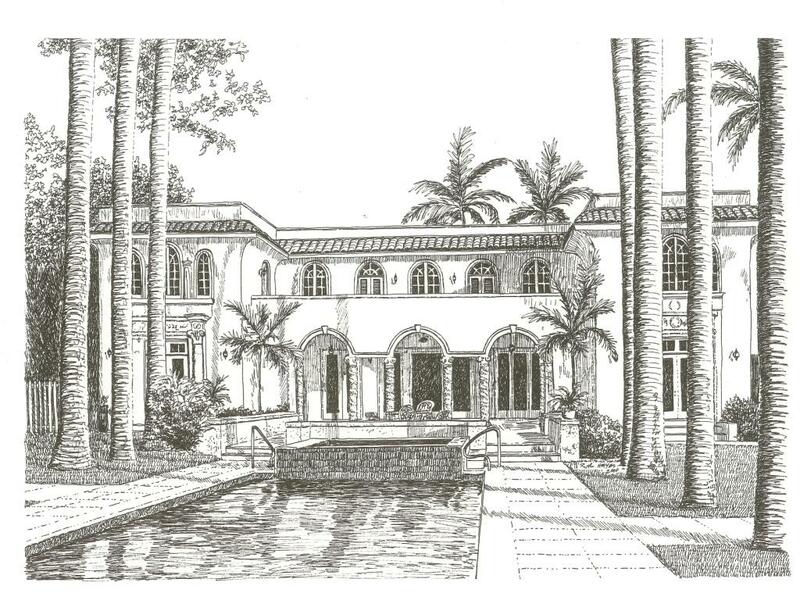 I was able to ink the Florida house this week and it wasn’t easy. I kept rechecking the landscaping, the entryway with the arch top windows, and the pillars to make sure I got it right. So much vegetation sometimes makes the details hard. There is a part of the house behind the palms on the left and I have to indicate something is behind them. It is an easy situation to overdo. I want to change some of the trees above the garage, too. It looks a little too much like a leafy crown on top. I’m waiting on color confirmation, but watercolor should be quick. I am leaving the name and address to last. I want to practice a couple of styles before I actually do it. It has been a long time since I penned anything except my name. When it rains, it pours. Right after starting the Ohio commission, I got another for a Florida house. Since I was waiting for some color confirmation on the Ohio one, I went ahead and drew up the new work. There is plenty of landscaping here so the trick will be to show as much of the house as I can and still have the attractive foliage. 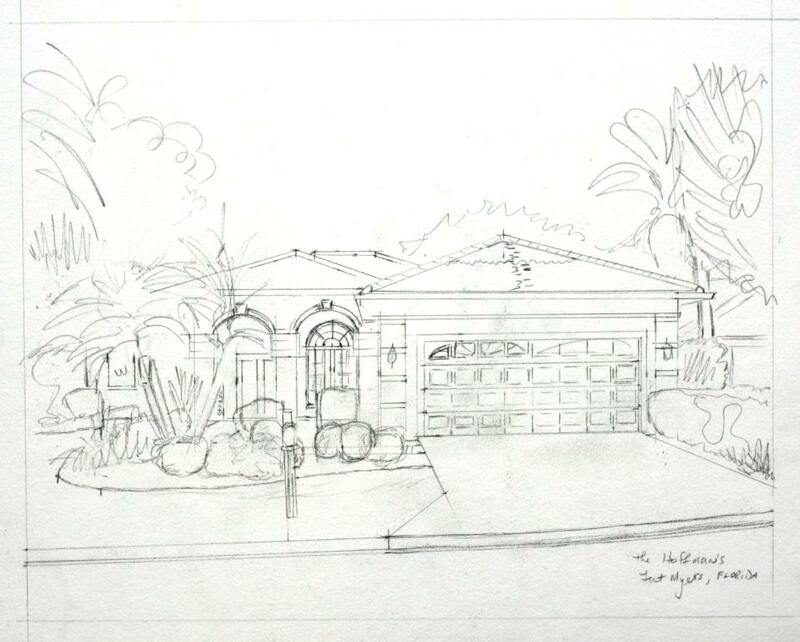 The entryway is slightly hidden and I want to make sure it is visible behind the palm trees and shrubs. I may move things a bit and cut back the palm trees, but nothing major. It won’t be hard to make this pretty. 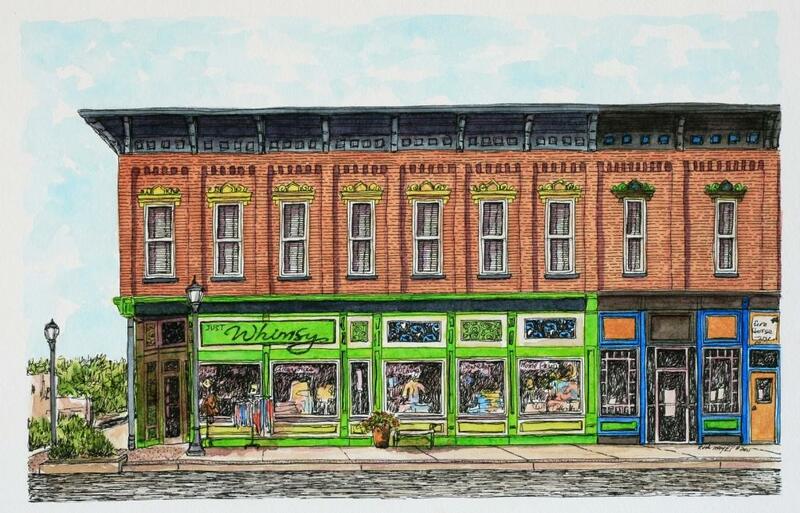 The buyer has specified watercolors and wants the gift recipients’ name and town in the corner. I’ll have to brush up on my lettering skills for that. I spent several days inking in the Victorian house. It was somewhat more complicated than you might think. There was a lot of secondary detail drawing as I moved through the various parts of the portrait. I first did most of the lower landscaping including the front tree and then the windows and screened porch and called it a day. The screen porch took a lot of concentration so it didn’t get too dark. I do like to move all around as I work on a piece so that I don’t over work an area and can keep the lights and darks balanced. The next day I moved to the fish scale shingles and siding. 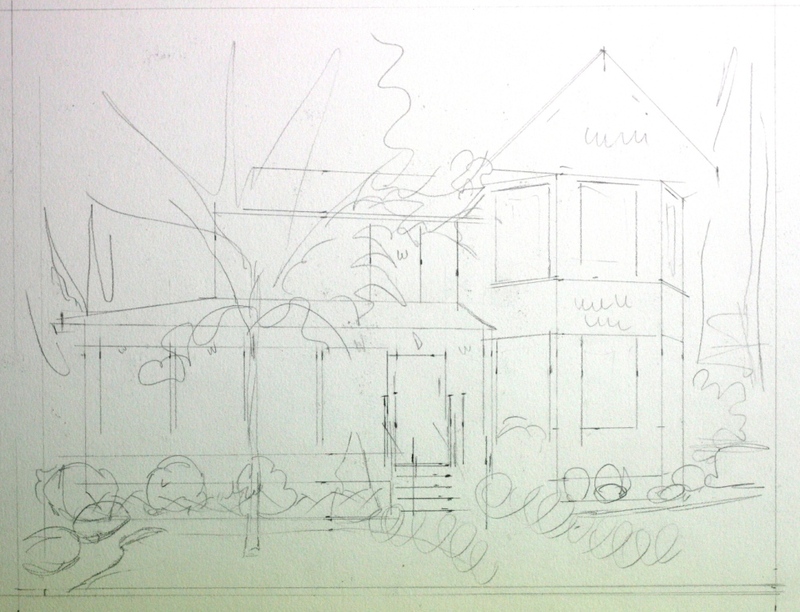 Again, that needed a lot of preliminary pencil layout so the siding and the shingles didn’t get bunched up. Then I worked on the upper windows, barely visible behind the tree. I couldn’t make them too visible or it would look odd behind the foliage. Lastly, I inked in the background foliage and touched up various places that I thought needed something extra. After I apply the color I will probably redefine some areas, mostly the semi-hidden upper windows. 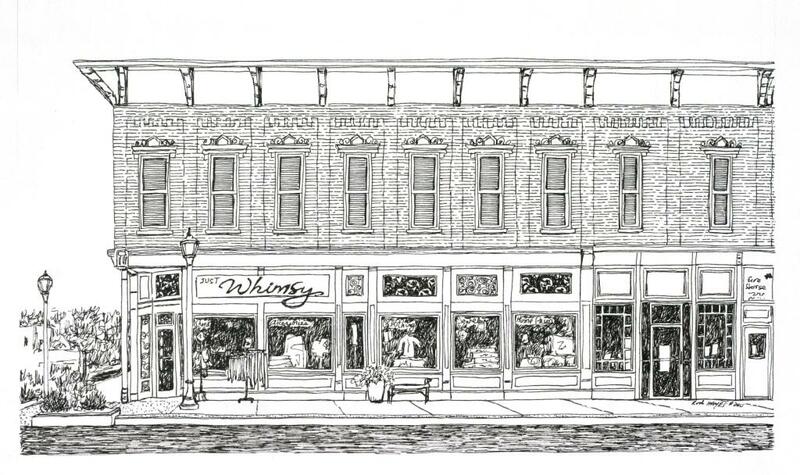 When I was close to finishing the last Jasper streetscape, I received my next commission. 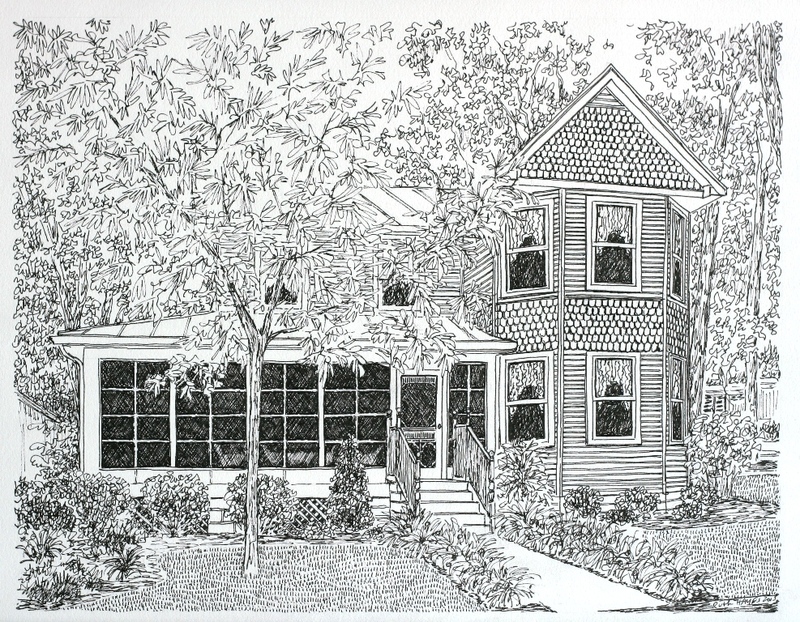 It is a lovely Victorian style home and the portrait will be given as a gift. There are fish scale shingles on the turret along with 4″ siding and the porch has been screened in. Since the house is solid white, I have to make the landscaping especially distinctive. This is only the barest of sketches, but I should be able to start inking tomorrow. Even though I worked on this streetscape over several days, I had a hard time with the green for some reason. The color would not lay evenly and even slicked up and separated some yellow out. I don’t think I ever used this particular color so thickly and I am not sure I like the way it performed. The color is interesting though and makes quite a statement. Looking at it after some days remove, I think I need to rework the area at the left corner, under the overhang. 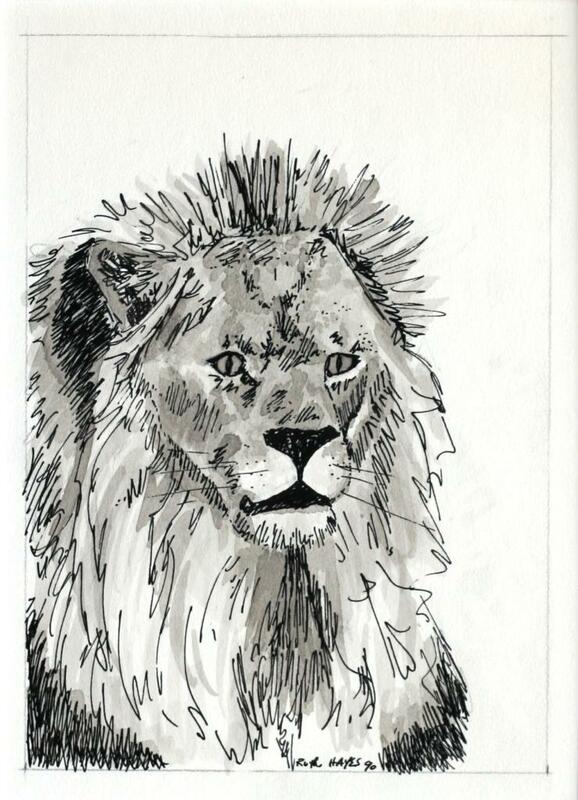 It looks slightly wonky to me and I think a small adjustment with the pen will fix it. I still like all of the vivid colors that the store owners have chosen. Now, here are two older pieces for the challenge. I looked at quite a few of my older works and I have used far more of them in the early days than I thought I did. I selected several and looked back to see if I had published them before and unfortunately I have used most of what I had. Still, here are two more. I saw Mr. Lion at a zoo and I took the photo for the creamery while I was at a family wedding in northern California. 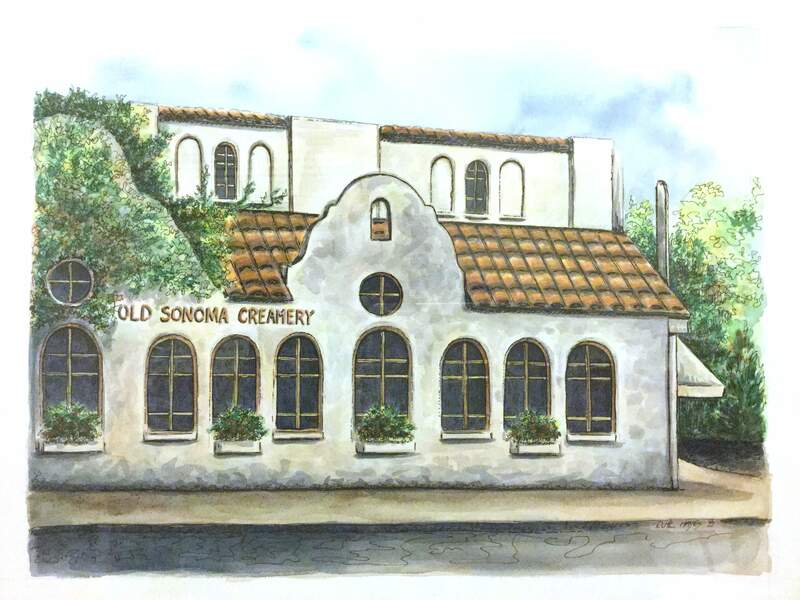 The creamery photo is under glass already so the colors are not precisely true. 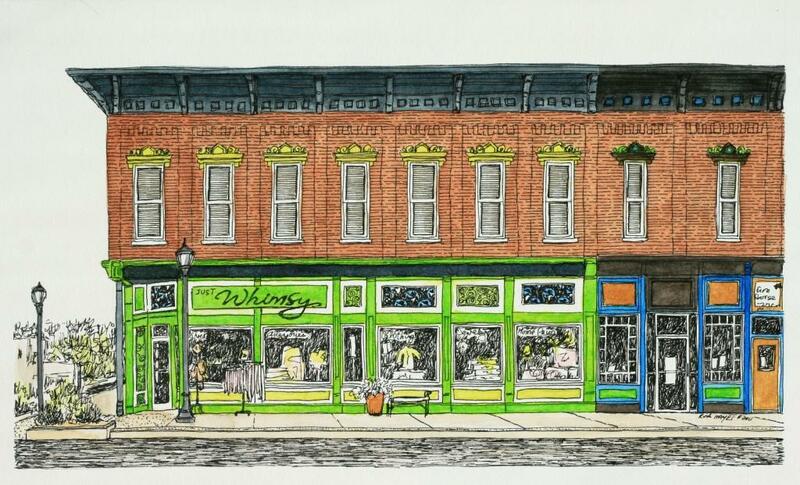 I’ve started the watercolors on the second Jasper streetscape. I need to let it dry totally before I add more depth and shading tomorrow. How do you like these colors? Jasper’s town square is a pretty lively colored place. I really like the bold green and blue accents. This should be a nice companion to the last one when it is finished. Last week, Tim Livingston (whose blog is linked on my blog roll) asked me to join an art challenge of posting 3 pieces every day for 5 days. I can’t quite manage every day but here are two older pieces. Part of the problem is that 4+ years ago when I started this blog (I can hardly believe it has been that long), I posted a lot of my older pieces to get me by until I knew were I was going with it. I have had to dig around and take some new photos as well as go through some earlier photographs. 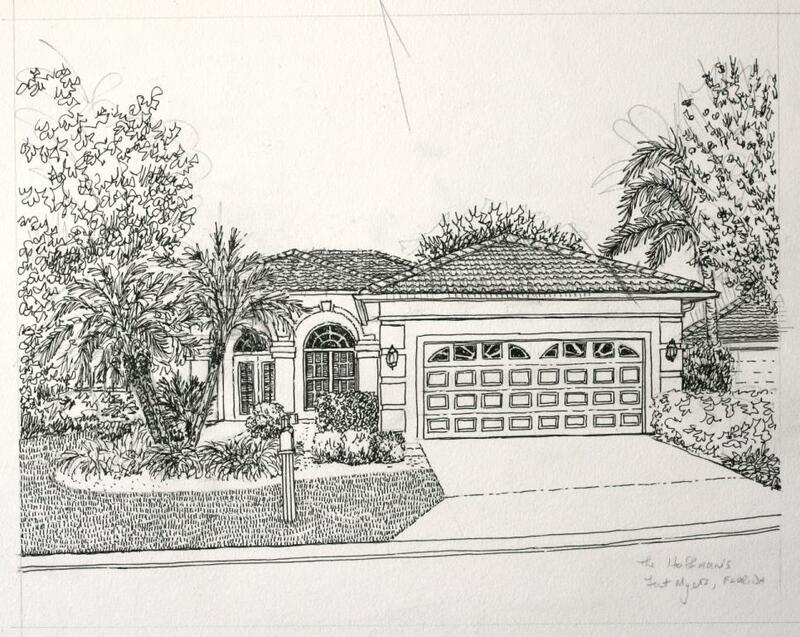 I came across this Florida pen and ink commission which I have always liked. And lastly for today, there is this one. 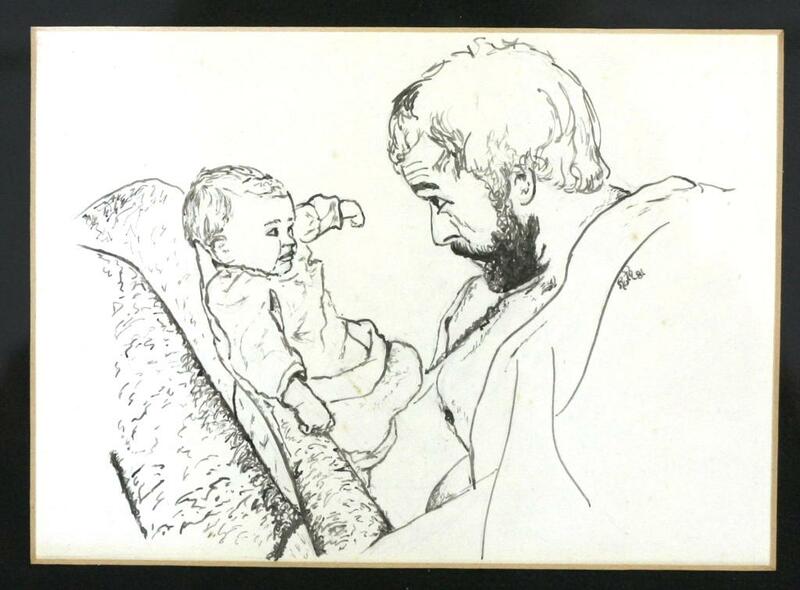 I rarely do people, but I did this of John and our daughter a few months after she was born. For obvious reasons, it is one of my favorite pieces. And it’s not too bad either. More to come with my next post. For some reason this seemed to take forever for me to ink in. I kept messing around with the detailing before I used the pen and I hope I haven’t scraped up the finish too much with all of the erasing. Watercolors are more sensitive to the surface than the pastels, so I will find out shortly. I’m happy with the way it turned out and look forward to putting on the brick’s reds and the trim’s yellows and greens. I like the daring of whomever made the paint choices. As I have said in the past, I think white is often for people who can’t choose a color. This streetscape is boldly wonderful. We lucked out with the latest winter storm as it went mostly south and we ended up with only a slippery dusting. There is now hope of seeing the ground again as warmer temperatures should melt most of the remaining snow and ice this weekend – I hope. I may actually get my car out first of the week and not be dependent on the 4wd truck.